Somebody correct me if I'm wrong, but I'm pretty sure this is the cheapest roundtrip flight ever found between Vancouver and Paris. And it's in June too. 2. Search for Vancouver to Paris, June 14 to 22. 6 Responses to "New record for cheapest Vancouver to Paris flight - $598 roundtrip after taxes"
What a deal! Some airlines charge this much for taxes! Looks like it is still available. 7.41pm Thursday. Unless I am missing something, the pic shows a RETURN date, not a departure date. This appears to me like it's a one way price, which makes sense, doesn't it? It shows the departure date on the left. It's in a grid format. @Chris, you're right. The cheapest price is $717 for the same date. It is always possible the rate could've been a typo. I've seen it happen. Once you click on the link to make a reservation, the rate changes. In any event, that period of time for travel to Europe seems to be on sale. @Hmmm - No, it wasn't a typo. The reason it's higher now is due to the popularity. X number of tickets are available at the cheap price, and once they sell out, the price increases. 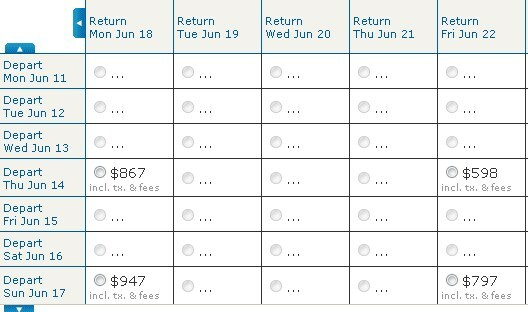 It's not unusual for Air Transat to offer significant price cuts like this, although it's usually to London or Amsterdam. A cut to Paris this large is quite rare, and I've never seen it drop quite this low (although it has hit $650 on occasion).